This article is no longer being updated as of 4:35 a.m., Sunday, Dec. 10. 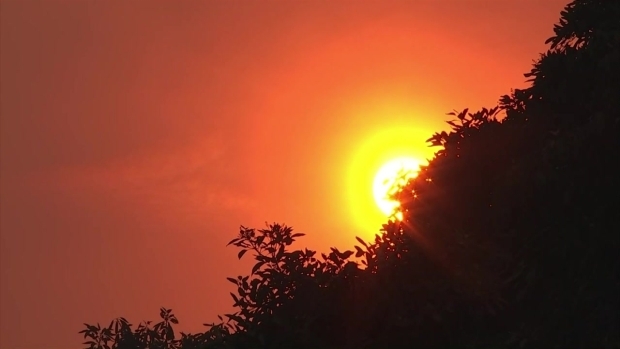 For complete coverage on the Southern California wildfires, click here. Fire crews are making "significant progress" Saturday near a five-acre brush fire along Norumbega Drive in Monrovia, authorities said. 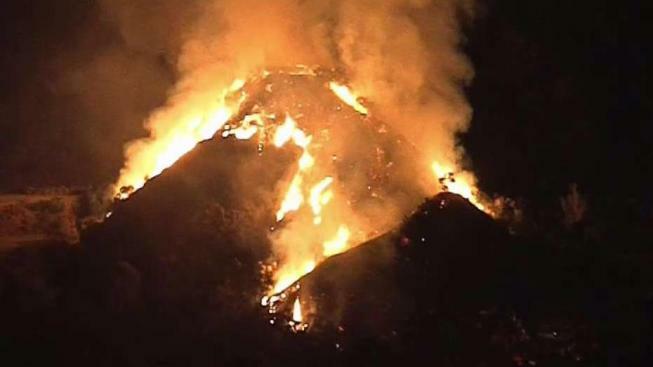 The blaze had reached about three acres first when reported around 7:40 p.m. in the 500 block of Norumbega Drive, according to Dispatch Supervisor Martin Rangel of the Los Angeles County Fire Department, which was providing mutual aide to the Monrovia Fire Department. The fire had grown to at least five acres, it was reported about 9:40 p.m.
Aircraft made water drops over the flames that made the hillside appear volcano-like. The water-carriers included four helicopters from the Los Angeles County Fire Department, which continued the work even after it appeared the flames were reduced, Dispatch Supervisor Jeremy Stafford said. The fire caused mandatory evacuations for about 200-300 people in the 500-1000 blocks of Norumbega Drive. A neighborhood and a group of about 400 people at the Camp Trask Boy Scout Camp were also evacuated, authorities said. But as firefighters progressed in dousing the blaze, the evacuation order was lifted for residents in the 600-1000 blocks of Norumbega Drive, according to Monrovia city officials. Evacuations are still in effect for about 20-30 people. Firefighters have a hose line laid down around the fire, and favorable weather conditions have helped crews get it under control. 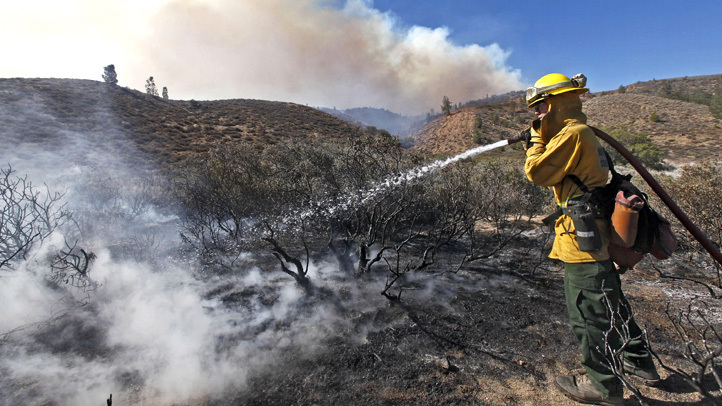 Crews from Monrovia, Los Angeles County and the United States Forest Service are helping fight the blaze. "The response has been tremendous,'' Monrovia City Manager Oliver Chi said. The city opened an evacuation center at the Monrovia Community Center, 119 W. Palm Ave. The city has coordinated with the Pasadena Humane Society to be on scene with pet-related supplies. It is not clear yet what caused the blaze.